Picker and, related, storage of samples on the robot. Capable of driving in a park type setting, e.g. no major rocky areas, some obstacles like trees and benches. Sensors for orientation and obstacle avoidance. Drive at 2 meter / second since that is a possible speed during the challenge. The robot may not need to carry all of the items listed above at the same time since some are only needed for specific experiments. For example, only a single camera may be needed when used to guide the picker toward acquiring a sample. I've gone through various vendors and reached a tentative conclusion on what to get. I rejected the simple 4 wheel platforms mounted on a solid box chassis. Most are a little smaller that I liked and while they do well for scampering around a yard I have my doubts about them in an environment with tree roots. Specifically, I don't think they will be sufficiently stable for testing when working with the cameras. Ground clearance might also be a problem. I considered a tracked platform such as the Lynxmotion Tri-Track because it is so neat but it suffers from the same problem as the square platforms. The platforms I mention on the hardware technology page are very appealing but just cost to much for a platform that is only for experimentation. 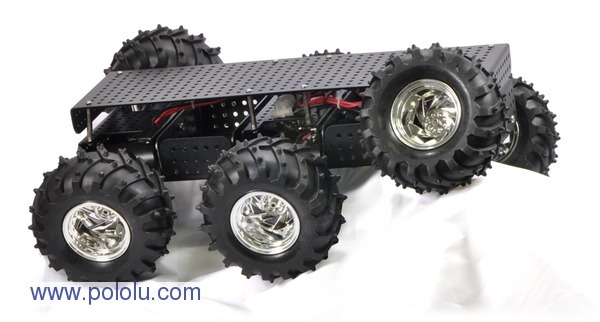 I am strongly inclined toward the Dagu Wild Thumper 6WD (wheel drive) available from many shops - Robot Shop, Pololu, and SparkFun - to name a few. One reason for naming all of them is the documentation on the platform is different on each site. By checking all of them I got a better idea of the capabilities. The Thumper is a good size (16.5" x 12" x 5") without being gigantic, i.e. it fits on a workbench and can be handled by one person. The suspension and ground clearance (2.5") look good. The carrying capability is 11 lbs so it should handle the devices listed above. Its speed in the 1:34.1 gearing is 7 km, which is around 2 m/s. That is probably unloaded but close enough it will give me a feel for the problems of controlling a robot at that speed. After considering it, I started wondering if it wouldn't make a good platform for a swarm using it and maybe its little brother 4WD version in combination. Since it weighs 6 lbs and can carry 11 lbs for a total of 17 lbs, there could be 10 of them in the swarm and still meet the total weight limit. Not that I can imagine setting ten of them loose for the challenge. The organizers would probably shoot me for requiring the ten judges to keep an eye on each robot.